Reacts with an intracellular 228 kD protein found in the nucleus during interphase. Live Ls 174T cells (human colon carcinoma). Our Abpromise guarantee covers the use of ab5675 in the following tested applications. WB 1/100 - 1/300. Detects a band of approximately 240 kDa. May be a structural component of the nucleus. Nucleus. Chromosome. Dissociates from condensing chromosomes during early prophase, before the complete disintegration of the nuclear lamina. As mitosis progresses it reassociates with telophase chromosomes very early during nuclear reformation, before substantial accumulation of lamins on chromosomal surfaces is evident. Publishing research using ab5675? Please let us know so that we can cite the reference in this datasheet. In order to choose the best NuMA antibody for this application, I need to know the epitope-recognition sites. For Ab86129, you only indicate a range (a.a. 900 – 1000) and for Ab5675, I could not find this information. Can you disclose the epitope-recognition sites for both antibodies? Also, could you provide Ab86129 and/or Ab84680 without BSA? If yes, at what cost? ab5675 immunogen is Live Ls 174T cells and epitope is not known. RE: could you provide Ab86129 and/or Ab84680 without BSA? These 2 antibodies are not typically available in a formulation without BSA. There are 2 alternatives to remove the BSA. 1. For bulk orders we can typically provide you with a custom formulation. A bulk order would require purchase of at least 10 vials of antibody. Bulk orders are provided at a discount. For further information regarding bulk orders please contact Andrea Gray at mailto:Andrea.Gray@abcam.com. 2. We have a protein purification kit that would allow you to remove the BSA containing buffer provided with the antibody and replace it with a buffer of your choosing. Please see our product https://www.abcam.com/Antibody-Purification-Kit-Protein-A-ab102784.htmlfor more details. Thank you for your reply. I'd like to try a new vial, if it's possible. And about permeability, I am particulary interested in looking at colocalization of NuMA with our target protein, Mx during metaphase. During metaphase NuMA is supposed to localize near the minus end of mitotic spindles (polar ends), which localize in the cytoplasm after the nuclear membrane breakdown. Mx protein is the cytoplasmic protein which I beatifully stain all the time in the cells. Also I sucesfully stained beta, gamma tubulin (form your company) in the cells. I could not even see the expected staing pattern of NuMA during metaphase. Therefore, I believe that permiablity is not the problem in my case. Again, I am interested in using a new vial to try again but if it doesn't work again (probably it won't),I would like to have a refund. Thank you for your time and suggestion. Thank you for your e-mail. This is to let you know that we have placed a new order for you one vial of ab5675 as a replacement vial from a new batch. For your information, the new order number is 80286. We hope this new vial will work. Please do let me know how you are getting on. I do not think your advice is helpful. First of all, using higher concentration of NuMA antibody is not good idea because I already observed very strong background when I usd 1:100 dilution of NuMA. Sounds like if this NuMA antibody can not even recognize the antigen (Hela) from the same species (human colon carcinoma), there is no way that NuMA antibody can recognize the sheep cell line. Ant yet, many other researchers showed that mouse mono-clonal NuMA antibody (from other company)clearly recognize antigens in Hela cells. I just want to have refund because I don't have any good reasons from you that I should try again. I would like to purchase the NuMA antibody from other company in stead. I just don't want you to misunderstand this. I really like products from Abcam. Other antibody worked great, just not NuMA. I am tyring to finish up my Ph.D program so I don't have time to get that posititive control you sugesst to find out that your NuMA is not crosreactive with sheep. Thank you for your reply. We are very sorry that you are not satisfied with our response. 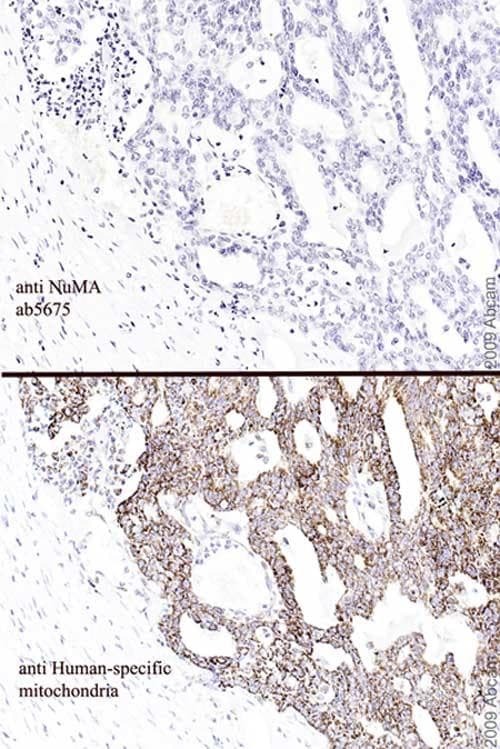 This antibody has been tested and characterized for IHC using human colon carcinoma. Unfortunately, we have no information if this product reacts with HeLa cells, although probably it should do. The staining is nuclear and cytoplasmic. Since it is a nuclear antibody, it may be necessary to permeabilize the cells before staining. Looking at our order and stock data, we have sold several vials from the same Lot and we have not received any complaint about this antibody so far. Previously, this antibody is being tried on ovine glandular epithelium fixed with paraformldehyde (PFA). Normally PFA treated cells or tissues give autoflorescence. If you want to try again, we can send you a new vial for testing or if you would rather get a refund the money, we can arrange it for you. Please do let us know how you would prefer to proceed. BATCH NUMBER 92289 DESCRIPTION OF THE PROBLEM Non-specific staining, I did not see any NuMA staining pattern I was supposed to see. For example, NuMA was supposed to be in the nucleus curing interphase, which I did not see. SAMPLE Sheep/ ovine uterine derived cell line (ovine glandular epithelium (oGE)cells) PRIMARY ANTIBODY Abcam. Anti mouse monoclonal to NuMA. Cells wre incubated with NuMA antibody RT for 2 hours. I used several dilution starting with 1: 100, 1:500, or 1: 1000 in 2%BSA-1XPBS. Cells were washed with three times for 5 min on the rocker before and after primary antibody treatment. None of them worked. SECONDARY ANTIBODY Molecular probe. I used goat anti- mouse IgM antibody(Alexa Fluor 555) with the dilution of 1:1000 or 1: 2000. None of them worked. 2%BSA-1XPBS was used as diluent. Cells were incubated with this secondary antibody for 1 hour at RT. DETECTION METHOD Absorbance of this secondary antibody was 555, which gives us red color. POSITIVE AND NEGATIVE CONTROLS USED Hela cells were used as a positive control because NuMA antobody was against human colon carcinoma. The setting of this assay was the sama as staining with oGE cell. Again, it did not work. Staining pattern was very similar to oGE cells. ANTIBODY STORAGE CONDITIONS 4C FIXATION OF SAMPLE Cells were fixed with 3% Paraformaldehyde at RT for 10 min. BLOCKING CONDITIONS Cells were blocked with Base solution including 1XPBS, 0.05% TritonX-100, and 2%BSA at 4C for overnight. HAVE YOU RUN A "NO PRIMARY" CONTROL? Yes DO YOU OBTAIN THE SAME RESULTS EVERY TIME? Yes WHAT STEPS HAVE YOU ALTERED? I used several concentrations of NuMA as well as sencondary antibody. ADDITIONAL NOTES I sent this enquiry 2 month ago but I did not get any emails back. I would like to have either a new patch which you confirm the sensitivity or refund. We from Dr Troy Ott' lab at University of Idaho purchased many antiboddies from your comany but NuMA is the only one that did not work. Other antibodies worked beautifully. We'd like to still continue to use your company's products because of the reliability, however, I do not think your technical help is very supportive. Please give us some suggestions or slutions. Thank you. Thank you for your enquiry. We are very sorry to hear that you are having problem with this antibody. We have looked at our computer system which stores all the technical enquiries, complaints and correspondence. Unfortunately, we have not received any previous message from you and this is your first e-mail which reached Abcam. We would like to draw your attention to the fact that this antibody has not bee tested for cross-reaction with sheep/ovine therefore we do not know if it recognizes this species at all. The immunogen used to raise this antibody is Live Ls 174T cells (human colon carcinoma). It is true that ab5675 recognizes human NuMA. However, HeLa cells are not human colon carcinoma cell line but human cervix carcinoma cell line. Good positive controls for this antibody are human tonsil, thymus, spleen tissue sections. We would strongly suggest using positive control along with the samples to make sure that the detection system works properly and the experimental conditions are sufficient. We would also advise applying higher concentration of this primary antibody i.e. 1/50. We hope this information will be useful for you. Should you still have problem with this antibody, then please do not hesitate to contact us again. Would you have pictures of Immunofluorescence using this antibody on human cells ? Thank you for your enquiry. We unfortunately do not have an image available for ab5675. The antibody has been tested for application in Western blot, Immunohistochemistry (Formalin-fixed paraffin-embedded sections), and Immunohistochemistry (Frozen sections), but has not to our knowledge been tested in Immunocytochemistry or IF. If you have any additional questions, please contact us again. Thank you so much for your patience. I had to contact the originator of ab5675 and have just heard back. Concerning ab5675, the antibody is red in color because it is concentrated medium from cell culture containing phenol red. The other antibody, ab3076, was not supposed to be red and your replacement was on order#41653 I believe. If you have any more questions or concerns please do contact us again.